The story’s moved on, but has your minifigure collection? Grab this ultra-cool instant update. 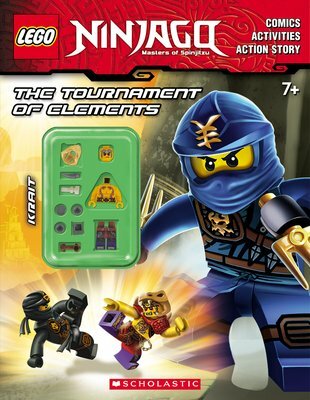 Big news: it’s an activity book from the fourth incredible LEGONinjago series. Bursting with games, puzzles, comics and a sizzling action story. Even bigger news: it’s got the latest gotta-have-it minifigure to get your collection bang up to date. Zugu in a wrestling suit? Done! Join the Spinjitzu warriors at the Tournament of Elements: the greatest ever contest between Elemental Masters. The battle can’t start till Zugu rings the gong!